It was in the sixth moon, then, and the rooms were very hot. Luckily, we were next door to the Lotus Lover’s Lodge of the Ts’anglang Pavilion on the east. Over the bridge, there was an open hall overlooking the water, called “After My Heart”—the reference was to an old poem: “When the water is clear, I will wash the tassels of my hat, and when the water is muddy, I will wash my feet.” By the side of the eaves, there was an old tree which spread its green shade over the window, and made the people’s faces look green with it; and across the creek, you could see people passing to and fro. . . . I asked for permission from my mother to bring Yun and stay there for the summer. . . . The whole day long, we were either reading together and discussing the ancient things, or else enjoying the moon and passing judgments on the flowers. There are several pavilions bordering the water at Cang Lang Ting. Shen Fu and his wife, Yun, might have sat in any of them—or all of them, at one time or another. Even though I am unsure of the exact place, I feel their presence when I visit the garden. I share that beautiful moment in their lives, before the sad events that waited for them, unforeseen, in the future. If asked, I always say that Master of the Nets is my favorite Suzhou garden. When I come here, however, I feel instead that Cang Lang Ting is my favorite. Although it is three times larger than Master of the Nets, it retains an intimate feeling. Where Master of the Nets seems planned down to the smallest leaf, Cang Lang Ting feels loose, natural, almost improvised. It’s just big enough to make you believe for a moment that you are lost in a vast, mysterious landscape or a bewildering succession of rooms, halls, corridors, and pathways. The next moment, however, you find your bearings and realize that you are almost where you started. Cang1 Lang4 Ting2 (沧浪亭) is sometimes called in English the “Surging Waves Pavilion,” or the “Blue Waves Pavilion,” or even the “Great Wave Pavilion.” I prefer to call it Cang Lang Ting ( the “c” in “Cang” sounds like “ts”). The pavilion (“ting”) sits at the garden’s highest point, atop an artificial hill not far from the entrance. But we will save it for last. Once in the door, bear right and explore at your leisure the southwestern end of the garden. If you have been to other gardens, you will recognize the familiar elements: corridors, latticed windows, round doors, views in every direction framed by the architecture. But at Cang Lang Ting you will see some curious variations. Look for latticed windows that are not square or rectangular but rather in free-form, organic shapes echoing the curves of flowers and leaves. Look for bizarre doorways that similarly resemble elongated leaves. One of them may appear to be the elongated face of a man wearing a strange, flat-topped hat. Look again, however, and suddenly you see a tall vase, with handles where a moment before you saw ears. Don’t miss the Elegant Bamboo House and the bamboo “forest” that surrounds it. Just nearby is, among all the round doors in all the Suzhou gardens I know, my favorite of them all—though I could never explain why. It exudes a feeling of peace. The Temple of 500 Sages memorializes almost 600 artists, scholars, statesmen, and generals of renown. You will need a Chinese scholar to identify them and learn their stories. The highest point at the southwestern end of the garden is called “Kan Shan Lou” (literally, “See Mountain Tower”). You won’t see mountains from the top, but you will see, among other things, some wonderful views of roof tiles. This may not thrill you, but some of us cannot get enough of these traditional tiles. I have an entire folder of photos devoted to them. Such obsessions cannot be explained, but if you share this one, be sure to climb up the Kan Shan Lou. A wonderful pond forms the magnetic center of this part of the garden. Surrounded by elevations on all sides, it begs to be circumnavigated. Whichever vantage point you choose, you want to move around to the opposite side and see what it looks like from there. Like the roof tiles, the pond invites you to linger and gaze. Once you have exhausted the wonders of the southwestern garden, you will emerge somehow in the central part, dominated by the Cang Lang Ting itself. Every direction reveals a different sort of beauty. You will climb up to the pavilion, of course, but first make a tour around it. Don’t miss the grove of yellow-bark bamboo, southeast of the Ting. Walk east as far as you can, then turn left and take the path that leads out along the water, and then past the series of small pavilions where Shen Fu and Yun must have spent the hot summer days and nights reading, talking, and watching the moon. Finally, saving the best for last, climb up to the Cang Lang Ting and enjoy a new collection of views. The pavilion itself is very small and simple, but the couplet inscribed on the two north-facing posts has a special interest. Most such couplets are, of course, written by a single poet and designed from the beginning to go together. In this case, however, each line of the couplet—one on the right, the other on the left—is taken from a different poem but selected so carefully as to form a beautiful pair. 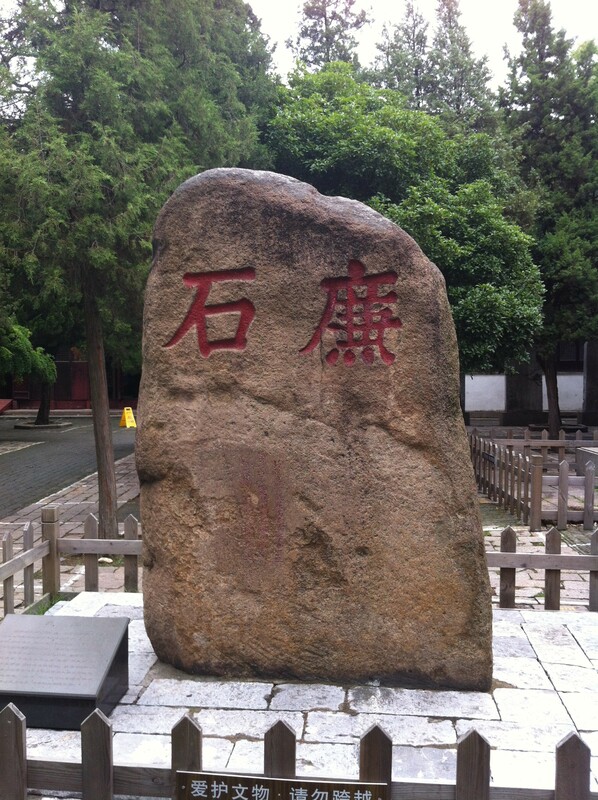 The stone honoring Lu Ji (陆绩, 188–219). On the west side of Ren Min Lu, directly across the street from Cang Lang Ting, is the Temple of Confucius. Walk out of the garden, and turn left after you cross the small bridge. When you reach the street you will see that there is a crosswalk here, but no traffic light; depending on the day and time, this could be an adventure. Once across, turn left, walk a few meters along the temple wall, and then turn right to reach the entrance. Before you enter, notice at the right a portrait of Fan Zhongyan (范仲淹, 989 – 1052). Fan was born in Suzhou and became one of the leading scholars and government officials of the Northern Song dynasty. He is remembered especially as an educational reformer who championed public education at the local level. Wherever you go in China, if you see a Temple of Confucius, you can be sure that a public school is close by; this is Fan’s legacy. You may have seen the gigantic statue of Fan in front of the Suzhou Railway Station, but if you immediately made the connection between that statue and this portrait you have a better eye than mine. When you are ready, cross to the western end of the porch, walking past the giant drum, and turn left. In a smallish room you will find four extraordinary examples of ancient stone engravings (stelae), each of them on a large, rectangular slab. They include a map of China; a map of Suzhou; a chart of China’s emperors; and a chart of the stars. (A copy of the map of Suzhou, by the way, can be found at the southern end of Ping Jiang Lu.) All four of these stelae are the work of the same artist, a man named Huang Shang (黄裳). Exit through the same door you entered, and walk down the corridor that forms the courtyard’s western limit. All along this wall are more examples of ancient stelae. Most of these are commercial documents, including one in which striking workers are ordered back to work. About halfway along the corridor, a door leads to the left into another large space. This was once the grounds of Suzhou High School, which is now next to the Temple, one door to the north. Today the old school is where the vendors of precious stones, antiques, trinkets, and all manner of other goods set up to sell their wares each Sunday. If you arrive on a market day, enjoy! If not, you will see the numbered spaces marked out on the ground for each vendor, and will have to use your imagination. The statue to the right of the stone depicts Wen Tian Xiang (文天祥, 1236 – 1283). Wen was a leading scholar of the Southern Song dynasty, but as his country was faced with invasion by Kublai Khan’s Mongols, he realized that warriors, not scholars, were needed. He was made a general and led his army to support Changzhou, which was under attack. The Song leader in Changzhou was cowardly and incompetent, however, and Wen’s army was defeated. Captured by the enemy, he was offered a post in the invaders’ administration if he would change sides and urge other Song officials to surrender. He refused, was tortured and held prisoner for several years (during which he wrote two classics of Chinese literature), and finally was executed. Return to the main courtyard. If you look eastward, straight across from the doorway, you will see a couple of very large, old, and beautiful trees that are well worth a bit of time. Then turn north, and ascend the steps to the main temple area. In the spring, as examination days approach, students still come here to make offerings and pray for good results. (For the students who attend the high school just next door to the temple, this is a very short journey.) It’s hard to know to what degree such behavior reflects real faith, or whether it’s more a question of, “Well, it couldn’t hurt, so let’s give it a go.” It is also difficult to know what Confucius (or Buddha, for that matter) would think of being transformed into a deity. Actually, I have a pretty good idea, but we will leave that for another day. Cang Lang Ting is a short walk south from the intersection of Ren Min Lu and Shiquan Jie, on the eastern side of Ren Min Lu. Bus 47 bus stops just east of the intersection, on Shiquan Jie. The Leqiao subway station (Line 1) is about a kilometer north, up Ren Min Lu.